We're teaching our kids to cheat, but don't worry. It'll help them get ahead in this competitive world. Lie, deceive, pull a swifty, sideswipe the honest kids. We live in a world of winners and losers, and you do whatever it takes to get ahead. Last week, The Irish Times published the results of Freedom of Information requests made to third-level schools. The figures show an increase in cheating. 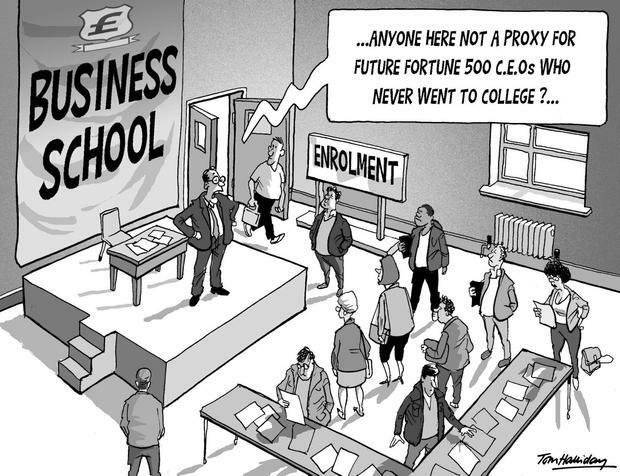 Business students are the most prone to it. At UCD, they are 21pc of the students, and 41pc of those found cheating. This is in line with international figures, in which - from the UK to Malaysia to Copenhagen - business students are the market leaders among the increasing numbers found cheating. Students at a New York business school allege a professor gave out answers during an exam. It's the no-nonsense way of getting the fee-paying students over the exam hurdle. In the brave new monetised third-level world, students are not scholars, they are clients. While figures in Ireland refer to students caught cheating, or suspected, many of the figures from abroad come from students finished with exams, who were surveyed and admitted cheating. This suggests that the real figures here are higher than those collected. Research suggests cheating occurs in early schooling, (this year, results were withheld from 80 Leaving Cert students, on suspicion of cheating) and that it continues through third level and into business life. Do students cheat because they see fast-buck artists shafting one another in business? Are they impressed by the enterprise of top executives employing platoons of professionals to help them dodge taxes? Or do business people, having successfully cheated their way through college, carry the same lack of ethics into their careers? Either way, there doesn't seem to be any great rush to do anything about this. Expensive propaganda campaigns are employed by politicians to tackle the minuscule level of fraud in social welfare, but the rise in third-level student fraud is taken as natural and inevitable. Penalties are meagre, the rising numbers reflect the lack of official concern. You do whatever it takes to get ahead. Perhaps the elders feel guilty, given the pressures the exam system puts on students. It would be unfair to place all the blame on the kids. We are, after all, training them for an acceptable level of sleaze. We make role models of business leaders who are openly contemptuous of their staff and their customers. The Residential Tenancies Board notes that scores of landlords are now cheating their tenants. In the scramble for State cars, politicians have one rule - whatever works. The current FG Government is happy to be propped up by the dependable Michael Lowry. One of Mr Lowry's manoeuvres was found by the Moriarty Tribunal to be "profoundly corrupt, to a degree that was nothing short of breathtaking". Today, Mr Lowry is an example to us all of someone thriving at local and national level. At the moment, FG and FF are looking for angles to help them win the next election. So, Leo Varadkar is promising us tax cuts if we vote for FG. No one likes paying tax, but it's what pays for the schools and the hospitals and the roads and the police. But Varadkar consistently plays to the anti-tax instincts of the well-off. Many believe his snow job, that they're the sole good people, paying for everything, while lesser breeds steal their wealth through public service salaries and welfare rip-off. We think of nurses as our saviours, and the unemployed as those going through a bad patch - something most of us have experienced. Varadkar and his class warriors paint them all as avaricious parasites. People who pull a fast one often need an alibi to brush aside their basic decency. So, they accept the argument that if they don't do it they'll be mugged by those who do. And, sure, everyone's at it. Lie, deceive, pull a swifty, sideswipe the honest business people. The class war philosophy of Varadkar and his FG/FF enablers is reflected in the adventures of dodgy CEOs, ruthless vulture funds, landlords illegally raising rents, and business students cheating. I do this not for our own good, they tell themselves, but to ward off the failure that faces me if the others -who are all up to something - do better. The same competitive culture which Varadkar promotes fuelled the massive waves of tax evasion in the 1980s and 1990s. "Tax reduces my competitiveness, so screw it." Tax evasion in turn fed the brown envelope culture of buying councillors and planning permission. "I have to do it, because my opponents are doing it." And today we have the large-scale "tax avoidance" industry. This involves lawyers and accountants hired to locate the loopholes written into the tax laws on the suggestion of the lobbyists employed by the wealthy to convey their wishes to the politicians. A tax cut gives us a small amount of money, maybe enough to buy the odd meal out. Those small amounts of money, of no great effect individually, collectively amount to billions, which could have a positive effect on the public services that sustain a society. It's not we who benefit from tax cuts, it's the politicians who use our money to win our gratitude. And who misuse that money by diverting it from socially beneficial purposes. Some decades ago, in the era of Charlie Haughey, I concluded that our political leaders believed that ethics is a county somewhere in England. Charlie was a thief, and he surrounded himself with some choice chancers. He was so obviously a crook that today many believe the sleaze ended when he was found out. In truth, the sleaze has merely been repurposed. Charlie used sleazy methods for his personal benefit. Today's leaders promote competitive sleaze as a political philosophy. We urgently need homes for people who can't afford the absurd prices of the gambler's market, where homes are affordable only to those on higher incomes. The solutions of earlier decades show the way. But, no - the class warriors in charge refuse to build houses people can afford, unless they can create "mixed communities". There is in this policy an ignorance of the decent, thriving estates on which past generations were reared. And a deep class contempt - all the worse in that it's delivered in condescending tones. They know what's good for us. Sleeping in your mother-in-law's box room, or in a "family hub", is preferable to living on an estate of affordable homes - unless the lower classes can be diluted by decent people from the comfortable classes. There's a lack of homes for people who can't afford big rent. Young people live longer with their parents, families sleep wherever they can find a bed. In a less divisive society, this would have led to a housing emergency. In the society where the market must rule, it led to the Government pouring money into "incentives" for developers and corporate landlords, in the hope they'll provide shelter at a profit. Very convenient, how a political philosophy ends up enriching a selected class. Pardon us, Taoiseach, if we're not impressed by a culture of competitive sleaze. Excuse us if we're sceptical of corporate heroes with the morals of a mugger. And forgive us for our contempt for politicians who are fashioning a culture that demands of our children that they do whatever it takes to succeed.